Happy Wednesday everyone! I hope your week is off to a great start! Last week I shared the best knee high/over-the-knee boots for fall, and today I wanted to share the best new ankle boots of the season. Fall fashion is absolutely my favorite fashion and ankle boots are a staple in my wardrobe. They are so easy to style and can be worn into spring so you really get your money’s worth! 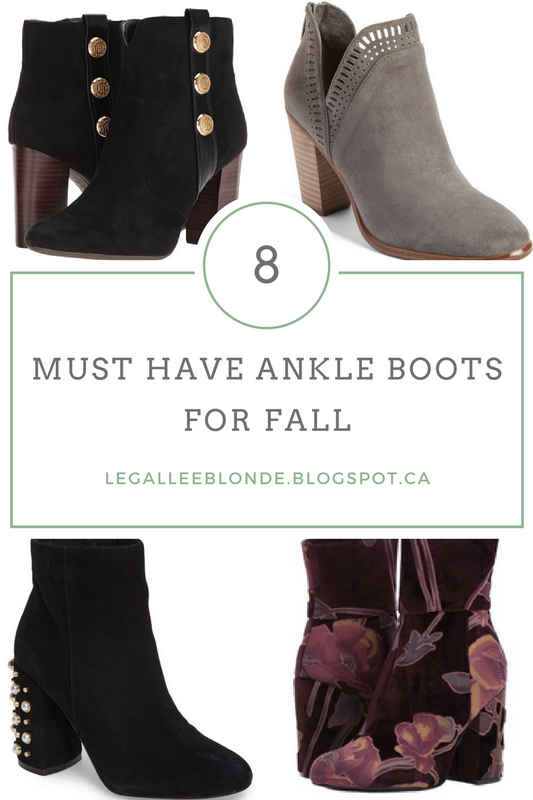 I’ve rounded up my top 8 favorite ankle boots (you can shop them in the widget below) so without any further ado let’s get to talking about why each pair of ankle boots is a must-have this fall! 1. Button Embellished Suede Boots: How stunning are these boots!! The military-inspired trend is everywhere this season (did you see the pieces I shared from the Banana Republic presentation at New York Fashion Week?) and I love that the trend is being incorporated into these suede ankle boots! 2. Split Shaft Suede Bootie: I bought these ankle boots during the Nordstrom Anniversary sale, and wore them at least three times last week (when the weather finally cooled down in Vancouver). They are comfortable and I love the split-shaft shape. I have the grey suede, but the tan would also be great for fall! 3. Pearl Embellished Booties: Embellishment is probably the biggest trend in fall footwear (you’ll see other embellished details in the other boots below!) and these black ankle boots make such a statement with the pearl-embellishment on the heels! These are on the top of my wishlist! 4. Floral Velvet Booties: These wine colored booties are so on trend and I cannot get enough of them! They combine so many fall trends – the wine color, the velvet material and the painted floral design. I definitely want to get my hands on these! 5. ASOS Suede Studded Booties: How chic are these moto boots?! I often shy away from rocker chic and edgy fashion because I struggle with how to style the pieces, but these are a great way to add a bit of an edge to any outfit. With jeans, a basic white tee and a jacket you’ve got an easy stylish outfit! 6. Teal Velvet Ankle Boots: As mentioned above velvet is a huge trend this season, and these teal ones are just gorgeous! The higher ankle height is a nice change and the teal color would be a nice pop of color in a fall outfit. 7. Embroidered Ankle Boots: The bright colors in this embroidery are so eye-catching! I just ordered these boots and can’t wait to get them! I already know and outfit I want to wear with them – a black cotton babydoll minidress and a black leather jacket. Perfect for a night out! Also, these boots are such a great deal at under $70! They only have a few sizes left though, so order them asap if you want a pair! 8. Velvet Sequin/Embroidered Ankle Boots: Okay, I had to share one more pair of velvet ankle boots. These are just to good to pass up! They colors are more subdued than the above pair, and perfect to wear with fall dresses and cardigans. I love the addition of some small sequins to these boots! "Leather Jacket & Favorite Lace Top"
"Shopping | Weekend Sales October 6-10, 2017"
There are SO many good ankle booties out this season! The embellished heel has been one of my favorite trends to date! It's such a great trend right! I love the pearl and embroidery embellishments. So many of these are on my list! I'm on the hunt for the perfect pearl embellished boots! Haha yes! Style twins! And ooo good call! Pearl embellishments are so pretty! Those purple booties are calling my name! I'm loving all those ankle booties!! But I think the pearl embellished heel has to be my favorite. I love the ankle boots I have! Love those burgundy ones.